It is a nightmare scenario, but maybe not the one you have been educated to anticipate: you are critically ill, and people call 911 to get you to a hospital. However, you have a life limiting medical condition, and you don’t want aggressive medical treatment. Nevertheless, once in the hospital, the physicians treat you with all the technology at their disposal. Patients find themselves getting care they don’t think they want for a variety of reasons. Physicians in the emergency room assume that patients come to them to save their lives. This assumption is reinforced by fears that they may be sued if they withhold treatment. Further, physicians and nurses may assume, often correctly, that the patients don’t understand the critical nature of their condition and dismiss requests for less treatment as uninformed or irrational. To address the need for clearer guidance to those caring for critically ill patients, Massachusetts has adopted a new approach, known MOLST (medical order for life sustaining treatment). 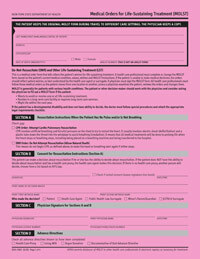 MOLST is a medical order on a bright pink form issued by a physician, physician assistant or a nurse practitioner. It outlines the types of medical care the patient does or does not want to have administered should the patient be hospitalized, in light of the patient’s serious health condition. How the Order is Developed. MOLST orders are only for patients who have a serious advanced illness. Before filling out the form, the physician, physician assistant or nurse practitioner must have an in-depth discussion with the patient, during which the patient’s medical condition, values and goals for care, treatment options and risks are all reviewed. Based on this information, the MOLST form is completed, indicating whether or not the patient wants CPR, ventilation, and/or intubation. The form can also state whether dialysis, artificial nutrition or hydration should be given, and other directives can be added as well. If the patient is incompetent, a health care proxy may sign a MOLST on behalf of the patient. Both the patient and the physician sign the form. The patient keeps the MOLST form, and presents it to medical workers. Its bright pink color is to draw attention to it, and to make it instantly recognizable. The orders on the MOLST can be revoked verbally at any time by the patient. You can get more information about the MOLST form here. It is a medical order, reflecting discussions and decisions reached by a patient and his or her health care provider. It is not a document drawn up by a lawyer and kept in a safe deposit box. It is not a general statement about last wishes, but informed and specific directives for care based on a patient’s current medical condition. It does not eliminate the need for health care proxies or advanced directives for those not seriously ill. There are some lingering questions about its use: Can hospitals recognize a MOLST issued by a health professional unknown to the hospital? Can a guardian sign a MOLST? Under what circumstances can a health care proxy overturn a MOLST order? Hopefully, over time, these questions will be clarified, and the use of MOLST will become a well-established option for seriously ill patients to communicate their treatment wishes.